Wonderful fabulous week and it’s only Tuesday!!! 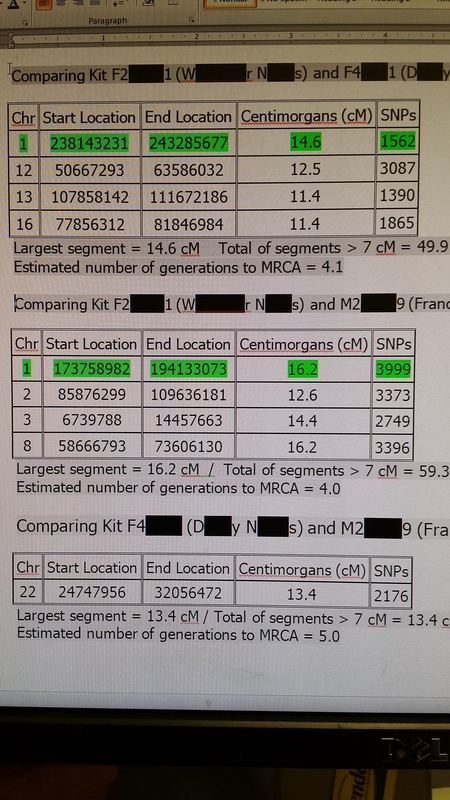 I spend so much time on the DNA sites; checking for new matches; looking at names, looking for hints of information. Calculating how can I be related to this person? How can I connect the dots of their life & world to mine. Where do they live now? Where has their family lived? Over thinking until I am exhausted and still empty. My cup runneth over with information; but it is too distant for me to make sense of it – YET!!!! But yesterday …. YESTERDAY I found out I finally have a surname I can call my own … Miranda!!! It’s official! thank good news for MY COUSIN TRACIE, who figured this all out. Her acumen in Gedmatch is to be admired!! I am still pretty green on doing this. Finally!! Finally!!! Finally!!!! HUGE sigh of relief!!! Late last night with the last bit of energy I had to stay awake; I exuberantly entered my newly confirmed surname into my profile on Ancestry, FTDNA & 23andme. It gets better though … I have been in contact via the DNA sites ‘in-mail’, email, phone calls, Facebook, texts and also working on Skype calls. I have been fortunate to have so many new cousins. These new additions are under the special grouping of primas & family in my contacts. I know each day how increasingly important they have become because each time I see an email or a call or even a FB entry that they have made; I cannot wait to get to it, to answer that call. And when I do, I am smiling from ear to ear! Truly, I consider them friends as well because they are lovely wonderful warm open hearted people. Well, this Friday I meet my cousin Karen IN THE FLESH. This is the VERY FIRST COUSINS I WILL MEET IN PERSON!! [squeal squeal squeal]. I cannot wait! Recently I started a Facebook page with just DNA matches. The criteria is that you must match a member on the page via DNA. So, everyone has either tested on one or more or all of the following DNA sites; 23andme, FTDNA, Ancestry & many have uploaded to Gedmatch. For selfish reasons; we have made the page ‘private’. So, no one other than members know what we post, when we post it. Basically – we are all a bit geeky in the DNA world. Some of us are much more adept at understanding this amazing technology / information than others. I fall into the category ‘than others’. I am a novice at understanding it all, but I am getting there. It is fortunate that I have these wonderful primas y primos to share, compare and query with. 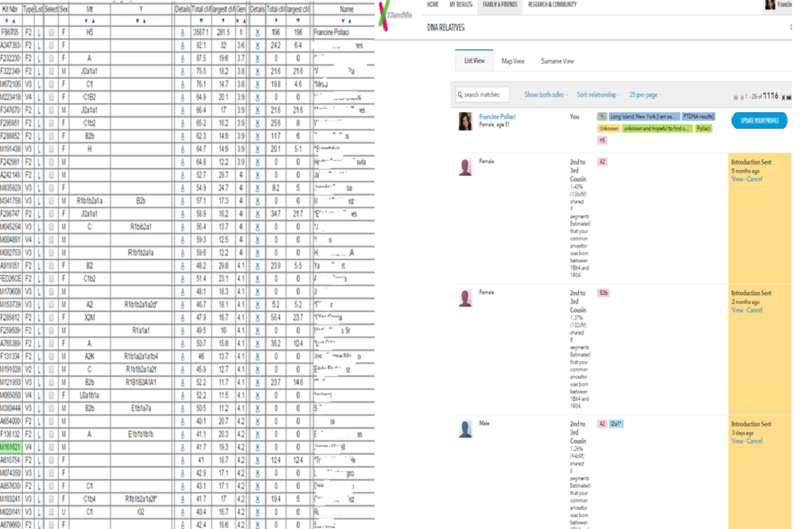 I look at these 1:1 comparisons on Gedmatch and I know there are answers here; but I am not a genetic Genealogist [yet – LOL] there are two cousins both related to me and to each other. They share the same surname. However, I am not related to them on the same chromosome. What does this mean? Well, a few months back I found out if we end up sharing on the same chromosome; then we share a common ancestor. Common ancestor – the theme of my search. I have been unsuccessful so far in finding a common ancestor. There is always the DNA response; Random Recombination which is, I think, the pat answer. When it lies outside the expectations, yet there is a connection. On a positive note; it’s a different experience connecting with people that you never knew about and share DNA with. I was thinking just the other day – these are 3rd plus cousins and I probably might have never met them had I known about them all my life / all their life. Here in the DNA world there is some strange and wonderful occurrence where we do not take each other for granted; we celebrate even the smallest shred of shared DNA. we welcome with open arms the cousins of our cousins that have also been invited to share in this ‘Secret Society’. Grateful to experience this new world; however confusing and frustrating [because the puzzle pieces aren’t fitting yet] at times it can be.